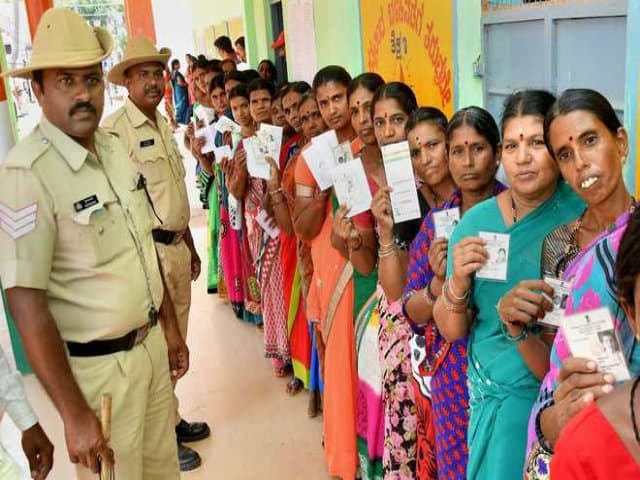 Karnataka’s ruling Congress-JD(S) coalition was ahead of the BJP in two of the three Lok Sabha seats and both the Assembly constituencies that went to the bypolls last weekend, electoral officials said on Tuesday. The BJP was leading only in the Shivamogga parliamentary constituency, where its state party chief BS Yeddyurappa’s son BY Raghavendra was ahead of former chief minister S Bangarappa’s son Madhu Bangarappa of JD(S) by 36,351 votes. Making inroads in the BJP-held Ballari Lok Saba constituency, Congress’ VS Ugrappa was leading over BJP’s J Shantha by 1,74,294 votes, officials said. Shantha is the sister of B Sriramulu, who gave up the seat after being elected to the state assembly in the polls in May this year. JD(S) candidate L Shivarame Gowda established an unassailable lead of 99,198 votes against the BJP’s new face Dr Siddaramaiah, a former official, in the party bastion of Mandya in the Vokkaliga belt in the old Mysuru region. Of the three Lok Sabha seats that went to the by-polls, BJP had held Shivamogga and Ballari and JD(S) Mandya. In the Ramanagara assembly seat, Chief Minister HD Kumaraswamy’s wife Anitha Kumaraswamy established a huge lead of 71,613 votes over BJP’s L Chandrashekar, who pulled out of the contest but officially still remains the party candidate. Chandrashekhar joined the BJP ahead of the polls but returned to the Congress weeks later, leaving the saffron party red-faced. Facing a no-contest, it will be a walkover for Anitha Kumaraswamy. In the Jamkhandi assembly segment in north Karnataka, Congress candidate Anand Nyamgouda was ahead of BJP’s Srikant Kulkarni by a margin of 32,933 votes, riding on a sympathy wave following his father and sitting MLA Siddu Nyamagoudas death in a road accident. The Ramanagara assembly seat was held by the JD(S) and Jamkhandi by the Congress. The parliamentary by-elections were necessitated after BJP’s Yeddyurappa (Shivamogga) and Sriramalu (Ballari), and C S Puttaraju of the JD(S) (Mandya) resigned as MPs on their election to the assembly in May. The by-election to the Jamkhandi assembly seat was caused by the death of Congress MLA Siddu Nyamagouda. The Ramanagara seat fell vacant after Kumaraswamy gave up the seat, preferring Chennapatna, the other constituency from where he had won. The by-elections are being seen as a popularity test of the Congress-JD(S) coalition, cobbled together after the May assembly polls that threw up a fractured verdict. The BJP and the Congress-JD(S) combine launched an all out offensive to break into each other’s bastions to gain advantage before the 2019 Lok Sabha polls.